Sanitaire Vacuum rear wheel axle for HEPA models. 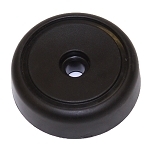 These part also uses a black bushing (73432A) to fit between the wheel and axle. This Sanitaire prt fits the following models.